Youth resistance has become a pressing global phenomenon, to which many educators and researchers have looked for inspiration and/or with chagrin. Although the topic of much discussion and debate, it remains dramatically under-theorized, particularly in terms of theories of change. Resistance has been a prominent concern of educational research for several decades, yet understandings of youth resi… stance frequently lack complexity, often seize upon convenient examples to confirm entrenched ideas about social change, and overly regulate what "e;counts"e; as progress. As this comprehensive volume illustrates, understanding and researching youth resistance requires much more than a one-dimensional theory. 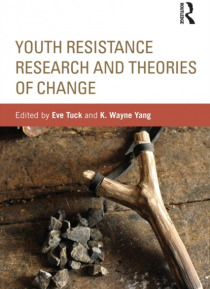 Youth Resistance Research and Theories of Change provides readers with new ways to see and engage youth resistance to educational injustices. This volume features interviews with prominent theorists, including Signithia Fordham, James C. Scott, Michelle Fine, Robin D.G. Kelley, Gerald Vizenor, and Pedro Noguera, reflecting on their own work in light of contemporary uprisings, neoliberal crises, and the impact of new technologies globally. Chapters presenting new studies in youth resistance exemplify approaches which move beyond calcified theories of resistance. Essays on needed interventions to youth resistance research provide guidance for further study. As a whole, this rich volume challenges current thinking on resistance, and extends new trajectories for research, collaboration, and justice.